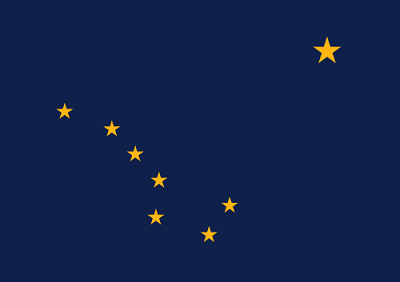 The State Flag of Alaska features a dark blue background illuminated by golden stars depicting the 8 stars of the Big Dipper and the North Star. It serves as a symbol of honor, heritage and regional pride and is displayed at state buildings. The Alaska State Flag is also flown on national and state holidays and on any other days proclaimed by the governor. There is an Order of Precedence for flags. State Flags are displayed in order as they entered the Union. Car Flags are often displayed to represent of an individual's allegiance to their state. Alaska State car flags are used by their owners as mobile emblems of their home. Car flags are usually made from strong materials and are attached to a car via a pole and clip window attachment. What is the design of the Alaska state flag? The design is a dark blue background (field) representing the night sky with eight golden stars, seven of which form the Big Dipper and the eighth is representative of the North Star. "The blue field is for the Alaska sky and the forget-me-not, an Alaskan flower. The North Star is for the future state of Alaska, the most northerly in the union. The Dipper is for the Great Bear—symbolizing strength." Who designed the Alaska State Flag? The flag design submission by Benny Benson beat 142 other entrants. Many of the original entries are on display at the Alaska Historical Library & Museum. What is the history of the Alaska State Flag? Alaska was claimed by Russian explorers in 1729 and subsequently the Russian Empire. On October 18, 1867 all Russian-American Company holdings were sold to the United States. The Alaskan Legislature adopted Benny Benson's design as the official flag for the Territory of Alaska on May 2, 1927. The Alaska flag is kept and used as required by the code specified in the constitution of the state.